The Fail building block is used to end an automation case run in the failed state. See the Introduction lesson to see an example of how to use it. The green input connector in the header is used to trigger the block to stop the running case and put it in the failed state. The title of the block (“Fail”) can be changed by double-clicking on it and typing in a new title. Define a message to be logged as the case is failed. Can contain tokens for field values (added below). Right-click and select “Insert token” to insert one or more field tokens. Fields that enable the use of external values in the message. To use the value of an added field, right-click the text field above and select “Insert token” and then insert this field’s name. 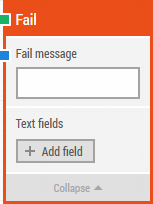 Add a field to be used in the message.